You are here: Home / General Real Estate / Interest Rates and Home Prices – What’s the Correlation? Interest Rates and Home Prices – What’s the Correlation? Read more at Calculated Risk and the New York Times. It is true that low rates make buying more attractive as compared to renting. And that can increase the demand for buying – and more demand might mean slightly higher prices. But if rates are low, a rational buyer will expect mortgages rates to rise when they sell the property, and under the theory that mortgage rates impact price, the price will then fall in the future. That makes the property less attractive, and the buyer in the low interest rate environment will not want to overpay for the house. So the buyer needs to consider both current interest rates and future interest rates, and by the time they are done doing all the calculations, you get the graph that Leonhardt shows. 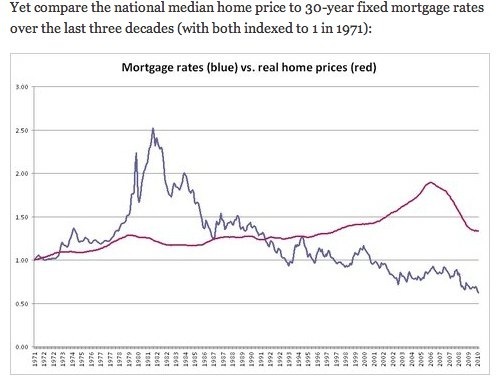 And that is exactly what I’d expect – there is little relationship between house prices and mortgage rates. That doesn’t surprise me at all. For perspective, in the Charlottesville MSA, the real estate market remains a matter of supply and demand. Right now, we have too much supply and not enough demand.